إذا كنت تبحث عن فندق بموقع جيد في كاثرين، فقد وجدت ضالتك في Knotts Crossing Resort . يقع مركز المدينة المثير على بعد 1 km فقط. سوف يعشق النزلاء موقع هذا الفندق، فهو قريب من أهم المعالم السياحية في المدينة كمثل مستشفى كاثرين, Katherine Museum, Cutta Cutta Caves Nature Park . يقدم Knotts Crossing Resort خدمات لا غبار عليها وكل أشكال اللياقة وحسن الضيافة اللازمة لإسعاد ضيوفه. تتضمن الميزات الرئيسية في هذا الفندق: مرافق مخصصة لذوي الاحتياجات الخاصة, واي فاي في المناطق العامة, صف السيارات, خدمة الغرف, مرافق خاصة بعقد الاجتماعات. بالإضافة لهذا,تتضمن كل غرف الضيوف مجموعة واسعة من وسائل الراحة . بعض الغرف توفر حتى تلفزيون بشاشة مسطحة, غرف لغير المدخنين, مكيف هواء, تدفئة, خدمة الإيقاظ لإرضاء أكثر الضيوف تطلباً. يمكنك طلب اللائحة الكاملة للخدمات في الفندق ومن بينها حوض استحمام ساخن, حمام سباحة خارجي, حديقة. 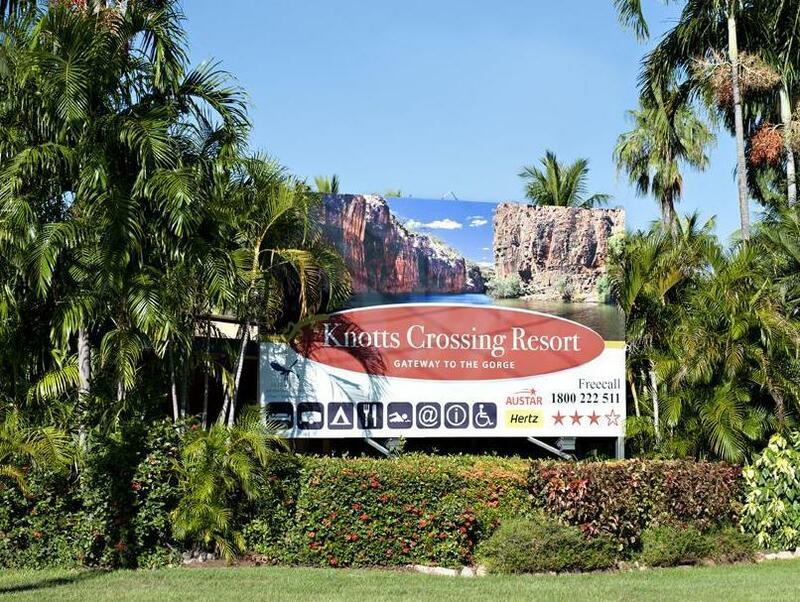 إن Knotts Crossing Resort هو خيار ذكي بالنسبة للمسافرين إلى كاثرين، بما يوفره من إقامة هادئة ومرحة. 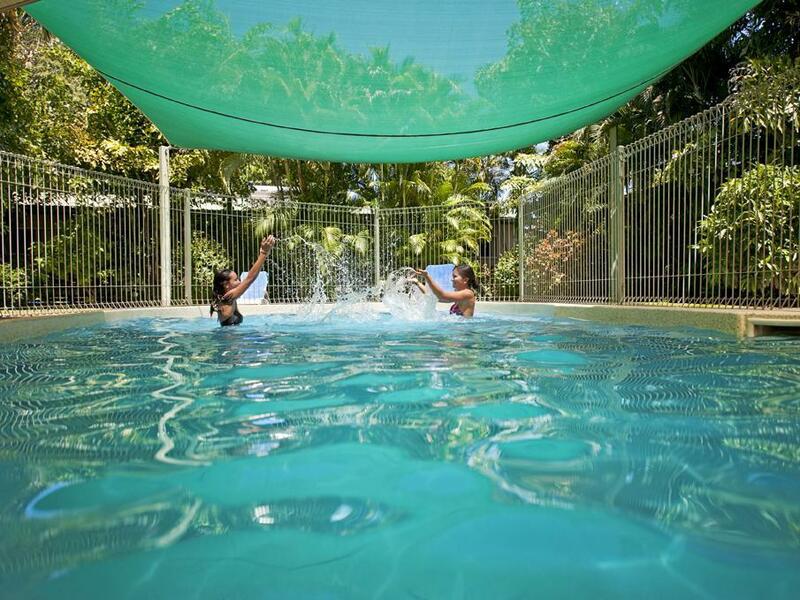 The staff were amazing - friendly and helpful and they had a good sense of humour. The village room with disabled facilities was fantastic with a cooktop, TV, comfortable bed, and spacious the two pools are well located at the resort amongst the lush gardens. I had meet other people that wished they had booked at Knotts Crossing Resort rather than where they were staying further out of town. I would definitely recommend Knotts Crossing Resort and would stay here again. I thoroughly enjoyed my stay. We only stayed overnight in a self contained cabin, it was nothing flash, still had a camping feel about it, which is what we were after and it was 5 star compared to a tent. The cabin and the resort had good facilities and the food was great. The reception staff were wonderful and the cabin was spotlessly clean but very old with cracked and torn Lino. The "ensuite" was a separate building to the cabin and again very old with poor drainage from the shower resulting in almost the entire floor being wet. However the bed was very comfortable, the air conditioner worked (it was a split system), and the water was hot. We didn't dine at the restaurant as the price out us off. So over all I'd score it 6 or 7 out of 10. Stayed in one of the cabins, had all we needed/wanted. Were clean and tidy and kept that way. Friendly staff that helped answer and sort any questions we had. Really had a great time. Nice and comfortable stay at the resort. 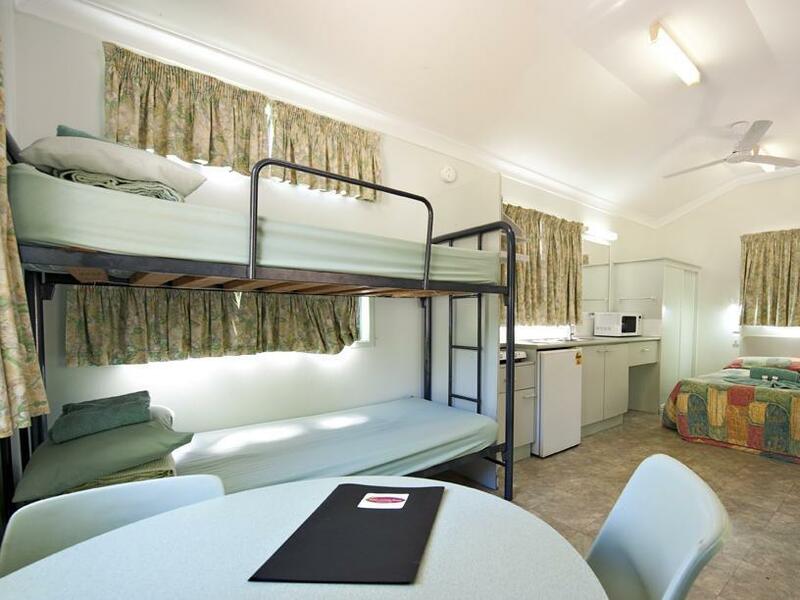 Room has all the amenities needed with cooking facilities to whip up simple meals. Location is very accessible. Check in and check out as very easy. Just some comment as their tagline is "a gateway to gorge" and i was expecting them to book for us as they have said it in their website but the just disappointed. Toilet utilities are also short of expecation as we are 5 but we are only supplied of 1 shampoo and conditioner but with 5 soap. And also no toothbrush and toothpaste has been provided. I think this Resort is located in a very good location. 3 mins drive to the nearest supermarket. It is also very near to Katherine Gorge. The best part is you are able to cook in the room. They have stove, microwave, plates, fork and spoon. Deluxe Motel rooms are comfy and roomy. Nothing flash and could do with a refresh in fixtures and furnishings at some point in the next 20 years! Great pool and restaurant with extensive and expensive meal options. Undercover car parking directly in front of your door. Lovely reception area, not much else. At the height of the Commonwealth games, we were not able to watch it on any of the boasted TV channels, nor the biggest rugby game of the year. Our toiletries were not refreshed each day, in fact we had to go to reception to get new items and the bathroom was serviced on two consecutive days. The room was subject to outside noise. The breakfast server was empty and it took an hour, so it seemed to get fed. Stunning gardens and friendly team - Amy, Jasper and Steve are doing a brilliant job making many improvements to Knotts - most importantly for the locals and the tourists alike. Upgraded to a motel room for a fraction more as the Village Rooms are quite basic. Will be interested to try the Executive Rooms one day and look forward to making a return trip!? !